Apexity Web Services - Hosting, Website & Graphic Design, Domain Names, Email, CMS, Postnuke, PHP-nuke, Consulting in Tampa bay, Florida area. 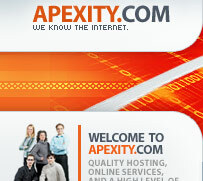 Email: Support@Apexity.com More information and contacts can be found on our Support page. Our new web site looks awesome. The textures, colors and action were exactly what we wanted. Great Job! This is the web site of Apexity, Inc.
or you can reach us by telephone at (877) 273-9489 or (813)787-4127. We collect the e-mail addresses of those who post messages to our bulletin board, the e-mail addresses of those who communicate with us via e-mail, the e-mail addresses of those who make postings to our chat areas, aggregate information on what pages consumers access or visit, user-specific information on what pages consumers access or visit, information volunteered by the consumer, such as survey information and/or site registrations. The information we collect is used to improve the content of our Web page, used to customize the content and/or layout of our page for each individual visitor, used to notify consumers about updates to our Web site, shared with other reputable organizations to help them contact consumers for marketing purposes, not shared with other organizations for commercial purposes. With respect to cookies: We do not set any cookies. Persons who supply us with their telephone numbers on-line sending us e-mail at the above address. Please provide us with your name and phone number. We will be sure your name is removed from the list we share with other organizations With respect to Ad Servers: We do not partner with or have special relationships with any ad server companies. Customers may prevent their information from being used for purposes other than those for which it was originally collected by calling us at the number provided above. With respect to security: We always use industry-standard encryption technologies when transferring and receiving consumer data exchanged with our site.